The verbs are the most variable element of the sentences. 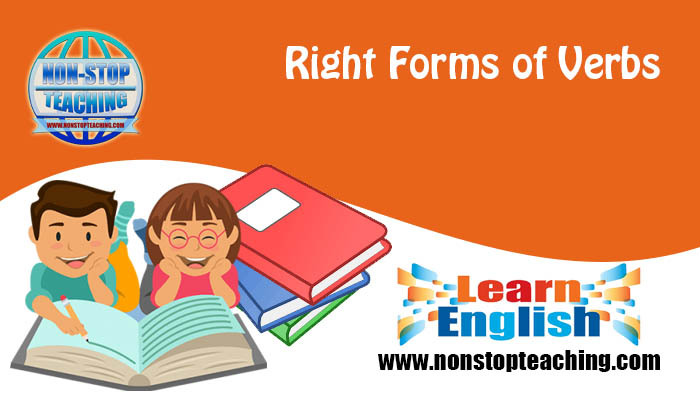 The right form of verb encompasses most of the grammatical rules of the English language. Every element of a sentence eventually relates to the verb. The verbs appear differently in a sentence on the basis of their subjects (subject-verb agreement), tenses, moods, voices, different structures, modals, etc. Note: Participles (without auxiliaries), infinitives, and gerunds do not work as the verb in a sentence. Gerunds work as nouns, but participles and infinitives work as adjectives/adverbs. Subject-verb agreement: the verbs are customarily followed by the subjects, and they must agree with the subjects according to their number and person. See the rules of Subject-Verb Agreement. The variability of the verbs mostly depends on different tenses of the sentences. A form of verbs depends on the time the actions have been performed. See the structures and details of The Present Tense, The Past Tense, and The Future Tense. The verbs are also related to the structures of different sentences and clauses. A clause has only one verb. In fact, a clause cannot contain more than one finite verb but can have participles (without auxiliaries), infinitives, and gerunds. I wanted (main verb) to go (infinitive) to the wedding. Swimming(gerund) is(verb) a good exercise to keep (infinitive) your body fit and healthy. Clauses can be connected by conjunctions and connectors. Some connectors take some specific forms of verbs. Conditionals use the conjunction if and it has some different sentence structures. See conditionals. The connector since has two usages. If since is used to indicate a cause, the verbs of the two clauses will be of the same tense. I didn’t go since you didn’t come. Since you were busy, I didn’t disturb you. If since is used to indicate time, the verb of the second clause will be different from the first. We haven’t seen(present perfect) each other since he left(simple past). 20 years passed(simple past) since we had met(past perfect). No sooner had, hardly had, scarcely had, etc. are the adverbials that require a past perfect tense and a past indefinite tense for the sentence. No sooner had I reached home than she left. Scarcely had the police reached when the man died. Hardly had I finished writing before the teacher ordered to stop writing. Coordinating conjunctions (and, but, or, yet, so) and although/though, as, because, till/until, when, whenever, as soon as, while, which, what, that, etc. connect two clauses which have the verbs of the same tense. We went to London when we were young. I got up, and he left the room. As soon as I came here, he greeted me. I could not go there because I was sick. As conjunctions after and before are used to connect two clauses which use past perfect tense and past simple. The past perfect tense always comes with a clause of simple past tense. See the past perfect tense for details and examples. The conjunction lest requires a modal should in the following clause regardless of the tense of the first clause. Run faster lest you should miss the bus. He will work hard lest he should get fired. He worked hard lest he should get fired. Modals always take the base form of the verbs after them. See Modals for details. The clause ‘it is time’ or ‘it is high time’ requires a verb in the simple past if there is a clause after it. It is high time + subject + simple past. . . . It was high time + subject + past perfect . . . It is high time + infinitive . . . . . . . It is high time you studied attentively. The conjunction as if/as though takes simple past/past perfect tense in the following clause. Latham played as though he had seen the ball very clearly. I slept as if I had been dead. He behaves as if he were her husband. Prepositions, articles, and possessives are always followed by nouns or gerund form of the verbs. I am thinking about doing the job. Alex insisted on going out then. To is the only preposition that takes the base form of the verb. However, there some phrases with to being at the end of them, which require the gerund form of the verbs. He went there with a view to confessing his crimes. I am looking forward to meeting the princess. I was used to sleeping at this hour of the day. He confessed to stealing that phone. To be, being, having, getting, etc. are generally followed by the past participle form of the verbs and other adjectives. Being tired, he took some time off from work. He became astonished being robbed in the daylight. John went to bazar having eaten a burger. He wanted to be educated. The causative verbs always take the next verb in its base form. See causative verbs and their usages. *Note: Get takes the next verb as infinitives/past participle. I had him wash the dishes. He makes me do all the work. He got me to make his dinner. I got the glass broken. Let him help her finish the assignment. The base form of the verb is also used in the clauses that use the subjunctive mood. Some certain verbs + the conjunction that requires the next clause to use the subjunctive mood and the clause uses the base form of the verb in it. Subject + the verbs of the above box (any tense) + THAT + subject + base verb + . . . . . He insisted that I stay at home. The office requires that we complete our work timely. I recommend that you wake up early. Note: There are some clauses also which require the verb of the next clause to be in base form. It is important that you invite him. It was necessary that I make a fence. It was recommended that you meet the principal. Since a single clause cannot take two verbs, it usually converts the additional verbs to complement by making them infinitives or participles or gerunds. - Some verbs always take the additional verbs as a complement by making them infinitives. He desires to go to Disneyland. He admitted doing the crime. We enjoyed riding the boat. Would you mind opening the door for me? The verbs are the most variable element of the sentences. The right form of verb encompasses most of the grammatical rules of English language. Every element of a sentence eventually relates to the verb. The verbs appear differently in a sentence on the basis of their subjects (subject-verb agreement), tenses, moods, voices, different structures, modals, etc.